Since its inception more than a century ago, Yoshinoya has steadfastly held to its motto: truly tasty beef bowls served speedily at a reasonable price. Yoshinoya’s commitment to quality has never wavered since opening in Tokyo’s Nihonbashi District in 1899, even stopping sales of its popular beef bowls in 2003 when a ban on American beef went into effect in Japan. Customers thought it was a radical—even outrageous—decision for a company whose primary product was beef bowls, to stop selling them rather than switch to beef available from other countries. Beef bowls were off the Yoshinoya menu for two and half years, until the import ban on American beef was lifted, and company officials say the Yoshinoya decision reflects the commitment to maintain the best quality in both service and product. 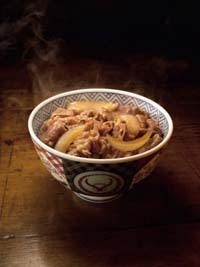 Its beef bowl recipe calls for American beef, and that’s all Yoshinoya has served for nearly eleven decades. As the ban was lifted, people formed long lines at Yoshinoya branches in all major cities in Japan, happy to have their beloved beef bowls back. The phenomena was so strong, Yoshinoya’s beef bowls were covered extensively by the national news media. Yoshinoya operates at 14 locations on Okinawa, with those in Chatan, on Gate 2 Street and near Okinawa City’s South Interchange frequented by countless Americans who love the tasty beef bowls. Yoshinoya’s popularity with Americans led to opening its first U.S. outlet, in Denver, in 1975. Today there are more than 80 Yoshinoya shops in the United States. All Yoshinoya outlets on Okinawa, with exception of those at Aeon Haebaru and Aeon Gushikawa Shopping Center, are open 24 hours daily. Yoshinoya shops in those two locations offer also Japanese noodles starting at ¥330, and other menu alternatives for those wanting something different. 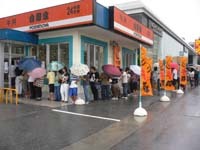 The long line of people waiting outside Yoshinoya shop in Naha at the time of lifting in 2006. High-in-demand taco rice is offered exclusively at Okinawa branches for \380.